My latest giveaway comes to you courtesy of Zoflora, a cleaning products company specialising in disinfectant. Zoflora are sponsoring the London Pet Show this year for the 3rd year running, where they will be headlining the World of Cats, Cat Talks and the Animal Action Arena over the two day event at Earls Court Two. Just leave a comment answering the question below, record your entry with the rafflecopter, and you’ll be in with a chance to win a family ticket for the London Pet Show as well as a fab Zoflora goodie bag! 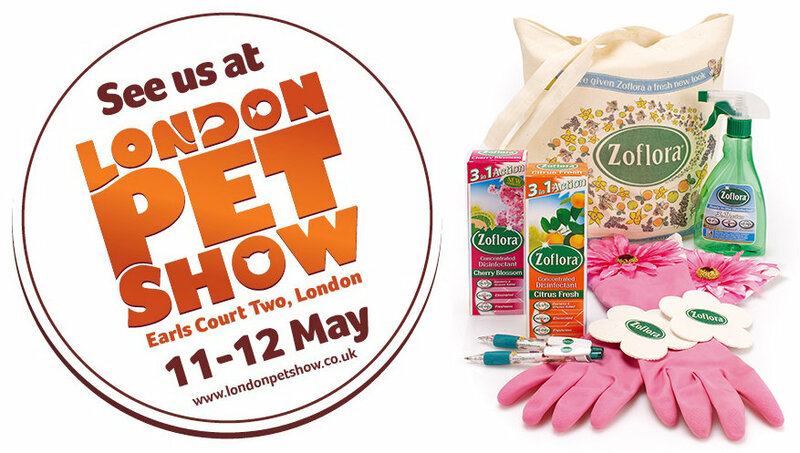 The family ticket will admit 2 adults & 2 children into the London Pet Show at Earls Court Two, London, and the goodie bag consists of a Zoflora canvas bag containing 1 pair of gloves, 2 pens, 1 Citrus Fresh, 1 Cherry Blossom, 2 Zoflora coasters and 1 empty Zoflora trigger bottle. To enter, head over to the concentrated disinfectant page on Zoflora and leave me a blog comment telling me which fragrance is your favourite, and record your entry with rafflecopter.